Next to the face, hands are the most expressive part of the human body. We throw them up when we dance for joy, or just play peek-a-boo with a baby. We raise both hands when our parents dress us for the day. We raise our hands when we know the answer to our teacher's question. In the library we reach high for that book on the top shelf. In dance class we raise our hands gracefully, and when we fall, we raise them to ask for a hand up. In the gym we go up to block a shot at the basket, and when we win we raise our trophy high over our heads. We march, raising our signs high. We begin small, but we grow big. 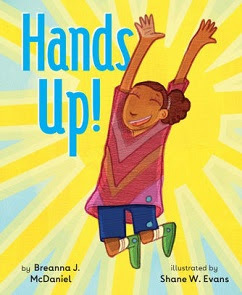 Breanna J. McDaniel's Hands Up! (Dial Books, 2019) explores the language and feeling of gesture in her just-published picture book that shows the many ways we raise our hands. Some gestures are small and subtle, for sure, but the hands-up movement pulls us up straight and tall. It's a move we all share, one that can mean many things--from submission (put 'em up!) or jubilation--but it rarely escapes notice! In his faux naif styled artwork, Shane J. Evans portrays the many meanings of this basic human gesture. "Ah, but a man's reach should exceed his grasp," said poet Robert Browning, and Evans' illustrations express that high sentiment, too. Reach high. Jump for joy and say "YAY!"